Home › Violence & Peace › Is it counterproductive to prepare Bluffton University students for a mass shooter on campus? Bluffton University is located in a ridiculously low-crime town compared to the average American town. My wife lost her wallet twice and both times it was returned by a stranger with all the cash. My family mostly bikes to get around town for work, school, and shopping and we never lock our bikes during the day. In 11 years, we have only had a problem three times when one of the boys left his bike outside overnight and the first two times someone just rode it to the Bren-Del dormitory at Bluffton University. I reported the thefts to the police and I would be happy to press charges if I catch someone “borrowing” a bike because it would be better to keep that kind of thing in check rather than to force everyone to have the daily hassle of carrying and using a bike lock around town. Bluffton is the kind of place where the police immediately text everyone in town when they discover that someone vandalized a couple of car tires on the way to school in the morning. In contrast, when I lived in Chicago, I didn’t even discover that there was a murder one block away from my home until I was talking with some neighbors a few days after the fact. I guess the murder wasn’t dramatic enough to generate media attention. Nobody in my old neighborhood even bothered to file police reports on the kind of petty vandalization that generates all-town police alerts in Bluffton. Even though Bluffton is extremely safe, Bluffton University students (and their parents) have been worried about college shooters due to media hype and they have been putting pressure on the administration to address the issue with our students. The statistics lead me to believe that it is a waste of time at best and may even be counterproductive at worst. It is important to put the risks of a mass shooter in context with all the bigger risks that students face. For example, according to the NIH, about 1,825 college students die from alcohol-related injuries every year and “between 1.2 and 1.5 percent of students indicate that they tried to commit suicide within the past year due to drinking or drug use.” “Approximately 1,100 [college] students die by suicide each year” according to Suicide Prevention Resource Center. If Bluffton students are representative of students nationally, we should be seeing several suicide attempts every year. In contrast, school shootings are really rare. I don’t know of official statistics, but the Huffington Post reported that in 2013, there were 18 deaths from shootings “on a college campus or close enough to campus for a school to believe the incident posed a threat to students” and that was in a year with enough high-profile shootings to warrant a news article about the issue. Most years seem to have less than that. The biggest year according to Wikipedia was 2007 when the Virginia Tech tragedy helped boost the national total to 34 college deaths. There are fewer campus shootings in America even in the worst year than the average number of lightning deaths in America (48/year). The US has had school shootings for about as long as the US has had schools, but kids have always been safer in school than away from school. Plus, students should be told that the US murder rate has been dropping for two decades and is now approximately as low as it has ever been in all of American history. 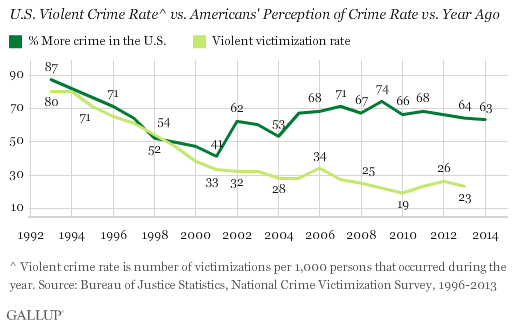 As VOX reported, Americans fear violent crime much more than is justified by reality. The violent crime rate was over three times higher back in the early 1990s than its level in recent years. Nearly two-thirds of Americans think violent crime increased over the past year, even though violent crime has been on a general decline for two decades, according to a recent Gallup survey. This is one reason the US still leads the world in imprisoning people. Politicians can still take some tough-on-crime stances simply because most Americans have no idea what the reality is on this issue. To help meet the popular demand to ‘do something’ about campus shootings, a couple years ago the Bluffton faculty and staff saw a professionally-produced video that showed a bunch of scary situations on a college campus. It looked like a product of industry efforts to militarize America’s police and that Mother Jones magazine has been documenting for years. The militarization of US policing comes from several demand side issues. First we really did have a crime wave in the 1970s and 1980s that most people thought would continue, but it didn’t. Secondly, as video cameras have gotten cheaper, there are more and scarier videos of shootings that are now always available on TV news and social media. Then Americans demanded more police protection after 9/11/2001 because they thought that 9/11 was the beginning of a new era of dramatically increased domestic terrorism, but it turned out to be a one-off event too. Fear of other forms of terrorism are similarly counterproductive. The risks to Americans are minuscule and according to Stephen Pinker (interviewed by Julia Belluz), overreaction to 9/11 killed more Americans than the attacks did. The greatest damage the resulted from the attacks was self-inflicted, in our individual and national overreactions to them. The psychologist Gerd Gigerenzer has shown that after 9/11, 1,500 Americans died in car accidents because they chose to drive rather than fly, unaware that a car trip of twelve miles has the same risk of death as a plane trip of three thousand miles. And of course the attacks sent the United States into two wars that have taken far more American and British lives than the hijackers did, to say nothing of the lives of Afghans and Iraqis. There was an increased supply of funding to militarize our police forces too because defense spending slowed in the 1990s due to the end of the cold war and that caused congress to look for other business to give their favorite defense contractors. They turned to supplying the police (and then homeland terrorism). One federal program to help defense contractors transition into supplying the domestic police market was called Program 1033. The Ferguson crisis was at least partly due to Ferguson’s overly-militarized police department which escalated the situation. The defense contractors who supply our police now have an incentive to increase the public worry about mass shootings and terrorism in order to justify selling military-grade SWAT equipment to local police departments and the result was that they produced nearly Hollywood-quality videos to distribute to schools about the dangers of school shootings. This is the kind of video that made it to a Bluffton faculty meeting a couple of years ago. Nobody knows how to best respond in an active shooter situation partly because shooters will adjust their tactics in response to what they experience in drills. Even the professionals have no idea what works and different security training vendors give the opposite advice from one another. America’s excessive obsession with rare dramatic violence isn’t just encouraging police overreaction. It also actively leads to copycat killings. For example, the media coverage of the 1999 Columbine shooting directly inspired at least 74 violent plots by copycats. Fortunately, there has been a little movement towards reducing the excessive hysteria that the media generates about mass shootings. Mother Jones documented several media efforts to reduce reporting that leads to copycat shootings and the FBI is also working on it. Schools should also do their part to get students and faculty to worry more about huge threats like suicide, alcohol, and car accidents and less about the miniscule threat of campus shooters. In fact, getting everyone on campus to watch dramatic videos of fictional mass shooter situations could make risks worse by making the idea salient to someone unstable. Past videos of mass shooters have inspired perpetrators to plan attacks and active-shooter preparedness videos could help unstable plotters think about how to defeat the countermeasures presented in the videos. Besides, the kind of countermeasures the videos recommend for unarmed faculty and student are pathetically weak in response to an active shooter and because the businesses who make the videos really want to sell defense equipment and services, they don’t have much incentive to make you feel safe. There just isn’t much the average person can do to in defense against a determined killer with guns. It takes a lot of training to be able to use a weapon effectively (as the Daily Show humorously illustrated), so even if we gave guns to all our students, most wouldn’t be able to do much to stop a suicidal killer. The kind of suicidal person that becomes a mass shooter cannot be deterred like a normal person. But we don’t live in fear of lightning strikes, and there isn’t any more reason to fear mass shootings in schools. We should be much more afraid of getting in a car or the drinking in the bar. Nowadays, to make active shooter drills ever more realistic, police are firing at teachers by surprise, execution style, with rubber bullets from real guns that are so powerful that they raise welts and draw blood. Lockdown drills have other limitations, too. As Campbell reported last year, the annual lockdown drills Marjory Stoneman Douglas High School had been holding for more than a decade weren’t enough to stop a shooter. In fact, the shooter was an expelled student who had likely been through those lockdown drills himself. Although small towns like Bluffton are really safe overall, they are exactly the kind of place where mass shootings tend to happen, and school shootings in particular. According to CityLab, 60% of mass shootings have happened in small towns and rural areas even though less than 29% of Americans live in them. And that shows all mass shootings. School shootings are a much rarer subset of mass shooting and they are even more predominate in small towns. This is a scourge that exists nowhere else in the world but in America and although it is a very minor cause of mortality even in America, it is only getting worse, so maybe we need to rethink our approach and look at how every other country succeeds at minimizing this kind of problem. ‹ 1/3 of Bloomberg articles are written by artificial intelligence!